The moves the activists are suggesting may be exactly the wrong thing to do at exactly the wrong time. As the largest deal in Chemical Industry history closes – with the combined equity value 40% higher than the day the deal was rumored – it is surprising to see so many armchair quarterbacks suggesting that they know how to run the businesses better than those charged to do so. It might be more understandable if the performance post-merger announcement had been poor – but it has not been – the stocks are up 20% over the last year and 13% YTD. While some performance may be in anticipation of the deal synergies, both companies have seen positive earnings surprises and positive revisions consistently since the beginning of 2016. 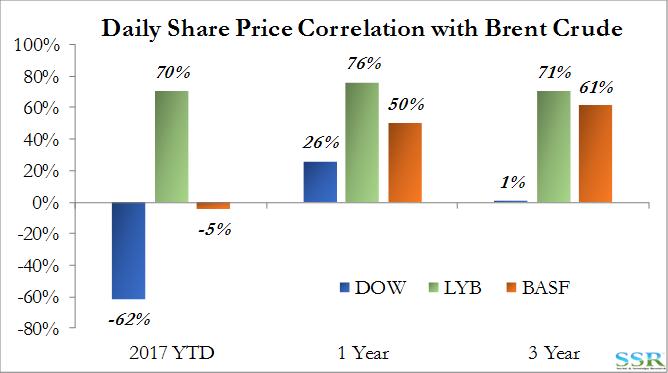 By contrast, LYB’s relatively flat 2017 estimate (versus January 1 2016) has been boosted by share buyback, PPG, PX, and APD have seen falling estimates and BASF is essentially flat. All of this in a very challenging market for Ag, which is a large component of both portfolios. Not least, LYB trades at a much lower multiple than DOW or DD today – unless the residual rose meaningfully in multiple, the move would be dilutive. Moreover, do we need another LYB? Dow’s the recent growth and earnings stability appears driven in large part by the integrated multiple chemistries that DOW is using to solve more complex and more time sensitive customer problems – an emerging trend which Dow appears to be in front of. In our view the activists are looking backwards not forwards in a market where dynamics are changing more quickly than at any point in the past. Looking forward, we suggest an alternate strategy to both DWDP and the activist camp. There is a powerful emerging theme around customer choice – customers having almost limitless information – wanting more say in product design, feel, efficacy etc., and faster development. It does not matter whether the customer is building automobiles or shopping on Amazon. DOW’s solutions based approach to customer interface and product development should continue to win market share. Dow Material Science can be split into a commodity platform and a specialty platform later if the current strategy proves unsuccessful. In the meantime, we see pro-forma earnings growing quickly – supporting our $100 per share target – Exhibit 1. What is all the fuss about? As a reminder for those not watching the day to day, we have an abbreviated playing field summarized as best we can in Exhibit 2 – both Dow and DD have many more business than those listed below but we have aimed to hit the highlights and the sticking points. The activists think that DWDP should spin out a Lyondell-like commodity business, comprised on base chemicals, plastics and polyurethanes. 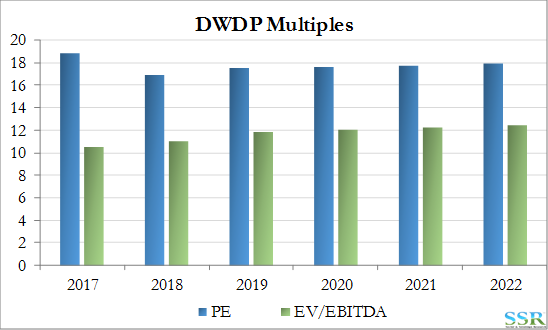 They then want one or more specialty companies, to include many of the businesses that DWDP wants to keep in material science – with Dow Corning (consolidated by DOW last year) the real hot button. Below, we discuss a third possible route – almost the “anti”-activist, keeping most of the portfolio together. The only thing we all agree on is the separation of Ag. Note that our suggestion is based on some of the broader industry trends that we see developing and gives DWDP the broadest platform to compete and more degrees of freedom to maneuver going forward. The Combined Portfolio Already Special? Whether the catalyst was Third Point, the deal, serendipity, Dow Corning, a plan finally coming together, the market moving to where DOW had already moved, or a combination, DOW’s performance since oil peaked in July of 2014 mirrors that of more diversified and specialty chemical companies rather than commodity or Ag companies – Exhibit 3. Dow of course mirrored DuPont precisely since the deal was announced and so we have excluded DD from the comps. 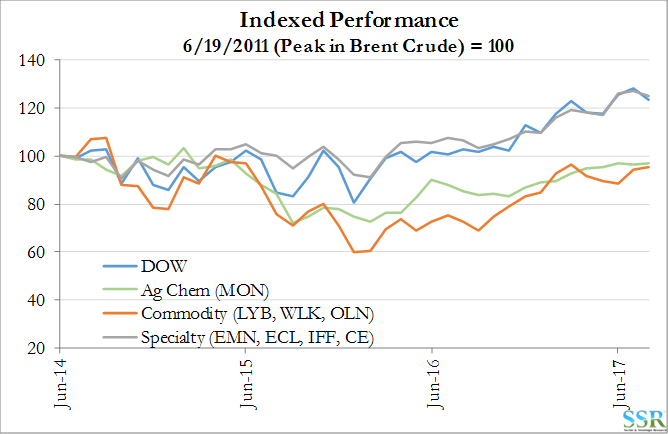 DOW also appears to have shrugged off the oil correlation that plagues LYB – Exhibit 4. We make a case that the new company should spin out Ag, sell the handful of specialty businesses for which there are obvious higher value owners and keep everything else. If DOW is finding unique and value added customer solutions by combining the Dow Corning platform with polyethylene, polyurethanes and other polymers, what is to say that there might not also be revenue opportunities with Kevlar, Tyvec and Nomex, for example? Shareholders should be looking for the best medium to long term strategy here, not something sub-optimal that creates a blip in valuation for a few weeks. Dow delivered a very strong “last” quarter against a backdrop of margin pressure in basic chemicals and plastics in the US. At the same time the company provided new data on why the proposed composition of the materials science company makes sense given the benefits of both integration and innovation. In Exhibit 5 we reprint a slide from a recent Dow investor meeting which shows not only the rate of adoption of new products, but also the higher margin that these products receive in aggregate – we have seen charts like this from many chemical companies in the past, including Dow and DuPont, but underlying earnings numbers have never supported the data – they do in this case. Dow is outgrowing its competition and has been able to deliver earnings growth in recent years with a consistency that we do not often see in chemicals. The top line growth surprise was driven by strong volume and pricing gains in many industries where underlying growth is much slower, suggesting that Dow is delivering the right product and is able to get pricing because of the quality offered. By contrast the BASF (the most obvious direct comp) numbers looked to be of much lower quality, with gains in commodities and energy and earnings declines in almost everything “value added”. This may be an accounting issue as Dow reports on an integrated basis and it is possible that, especially in Europe, Dow made more money in the commodity end of the chain than the more value added end. 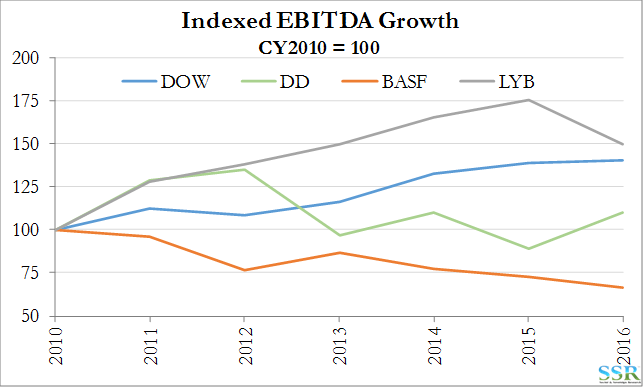 Still, the quality of Dow’s earnings looked much better than the quality of BASF’s and the path is impressive – Exhibit 6. While the commodity elements of Dow’s portfolio will always provide some price volatility, the company is also seeing consistent strong volume growth – Exhibit 7. At the same time, DuPont is also hitting the cover off the ball with earnings; beating on revenues as well as driving out costs – the only relative disappointment being earnings in Ag, though much of the disappointment is coming from businesses within Ag that DuPont will be divesting. 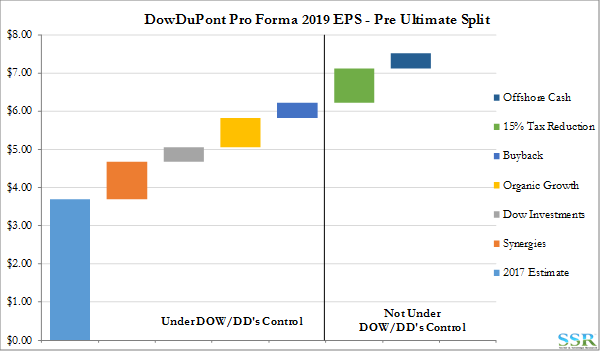 Over the less than two years that Ed Breen has been in charge he has set DuPont up to be on an EPS growth trajectory of more than 60% from end 2015 to end 2017 – something only achieved by prior management when bouncing off recessionary lows. Is DowDuPont (by accident or by good judgment) Ahead of an Emerging Trend and Are the Activists Driving in the Rear View Mirror and 180 Degrees Wrong? This is a subject that is hard to research, but all the signs are pointing to a World where customer preference is gaining momentum faster than in the past, and while the customer has always been “King”, the King now has access to almost unlimited data (especially about what its customers and the consumer are buying and about what its competitors are selling). In an Amazon and Social Media driven World everyone knows everything or at least can get everything or learn about everything with ease. How many Amazon products with less than a 4-star rating sell – in fact, unless you get a 4-star rating or higher, can you even market on Amazon today? Everything is reviewed. To win in this environment two core historical chemical industry “strategic absolutes” should be rethought – operational excellence and R&D. In our view, part of DuPont’s failure, prior to the CEO change, was a culture driven by invention – get enough smart people together and they will come up with something new and exciting and people will pay! The reality is that this approach did not pay, and that almost everything that companies have done successfully over the last 10+ years (dominated by the Europeans, Ecolab, Dow and a few smaller cap names, such as POL) has been on the Development side not the Research side and it is almost always driven by the customer. Dow, after many false starts, appears to have this process in place, and its ability to drive higher margin volume and value growth through using its broad range of chemistries to solve customer problems quickly has helped drive the stronger and more consistent growth that the company has seen recently. Buying Dow Corning may have been forward thinking and inspired in this respect, rather than opportunistic, as it allows Dow to enter the “how do we solve your problem” discussion with more interesting and unique tools in the belt. What could this approach do for the specialty portfolio at DuPont – especially in traditional chemistries (not sure it applies to electronics or health and nutrition)? 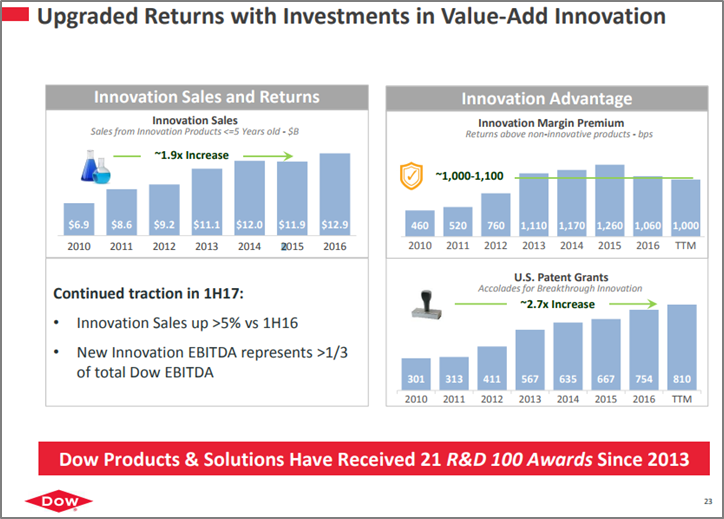 While Ed Breen has done a great job cutting costs and some of the nebulous “central R&D”, it is likely that DuPont’s R&D is still not focused on solving customer problems with the speed and the dexterity that Dow is showing. This argument might suggest keeping all the businesses together (ex-Ag) for a while as this may drive a source of additional revenue synergy! Plus, some of DuPont’s unique polymer technologies might provide for some interesting combinations with some of Dow’s chemistries. Outside packaging polymers there is little to no chemistry overlap. Amazon and others are dis-intermediators, requiring your product to be shippable rather than simply bought in a store. At the same time, you must accept that you are liable if the product does not arrive intact. And, that a handful of bad reviews can put you out of business. So, you cannot afford to compromise with the cheapest materials and you cannot afford to compromise on the cheapest packaging (unless you are selling on that basis) – you will pay for reliability. As a food manufacturer, in an increasingly competitive food market (Amazon again in the US), you will pay more for reliable and advanced packaging that gives your food longer shelf life, allowing you to sell to greater distances. Personal care and cosmetics: this is an area where advertising is high and consumer reviews dominate – market share can be won and lost very quickly, with the next right or wrong product. Automotive – light weighting requires unique polymer and adhesive solutions – and a “better customer experience” interior requires combination of multiple polymer and adhesive platforms. Also – down the road – no pun intended – who will make the fleets of inevitable autonomous taxis and what will they be made of? DWDP has as much opportunity in this space as anyone else right now. As a manufacturer, simply pushing more of a product into a market that does not want it will have only one result – Dow learned this first hand with acrylic acid after the Rohm and Haas acquisition. Having the flexibility to make the right grades of basic plastics to feed a more advanced product, or the right polyurethane grades/blends to meet specific demand, should drive higher chain profitability but likely requires the integration to get it right, and the discipline to alter operating rates so that supply of your higher value-add grades meets rather than exceeds demand. We see this “more powerful customer theme” everywhere and have had some interesting discussions with respect to GE’s Power business, for example (a subject for another piece of research). This is not a chemical industry issue – it is impacting everyone in the manufacturing space. Drive synergies and do whatever it takes to “over-deliver” on magnitude and timing. Cost initiatives must come first. Separate Ag – either by spinning out Ag or spinning out the rest – all together. Examine the synergies of holding on to the DD specialty platform – does it make sense? Can it add value? If not spin it off. If not – then separate into a large specialty business and large commodity business. The moves that the activists are suggesting may be exactly the wrong thing to do at exactly the wrong time. 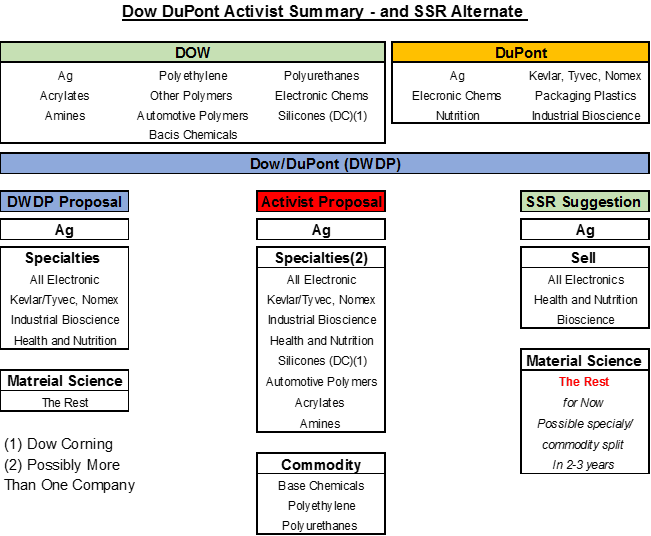 It is also worth noting that while the activists may be focusing on portfolio change to exit undifferentiated commodity businesses, neither DuPont nor Dow shows a history of sitting on its hands. In Exhibit 8 we show portfolio changes for both and add BASF. None of these companies is standing still – why should we expect any different behavior going forward. We are combining Dow and DuPont and assuming only the deals that have been announced to date – i.e. the transactions required to get the deal done and the Sadara announcement. We are making no split/breakup assumptions – the whole company stays together. Revenue growth of 3% in all years except 2018 (which benefits from the Dow Gulf Coast investments and is closer to 5%). ALL the noise in 2017 goes away. Post 2017 we are assuming no charges, no gains or losses on sales, no write downs, no changes in working capital except for a steady slow reduction in receivables, payables and inventories relative to revenues. The company trends towards a cash balance of 5% of revenues and all surplus cash is used in share buyback. Synergies come from both cost of goods sold and from SG&A. R&D (especially D) remains at or close to 2017 levels. The Sadara deal costs $3 billion in 2019 – we are assuming cash but would not be surprised to see a stock deal instead. Plus, a new phase of Saudi investments. 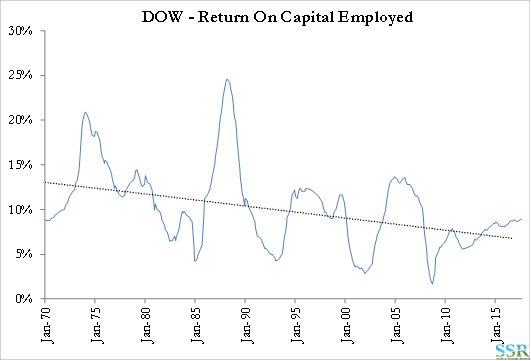 If this is the case our forecast of around $4 billion of Capex will be too low from 2020. We have made no changes to net debt or interest rates but accept that debt will be retired and issued continuously. There is a case for increasing debt and buying back more stock. EBITDA ramps from a very noisy pro-forma $16 billion in 2017 to $22.5 billion in 2020. The company can buy back as much as 20% of outstanding shares from 2018 to 2022. We stand by the earnings bridge that we published previously – Exhibit 9 – but in Exhibit 1 we show $6.00 for 2019 without an ethylene recovery and $7.00 with an ethylene recovery – which we expect, so on balance we are more bullish. In Exhibit 1 the higher outer year earnings in the “ethylene cycle” bars are simply a result of higher share buyback in 2019 and 2020 because of the higher earnings. The share price in Exhibit 1 creates the EPS multiples and EV/EBITDA multiples summarized in Exhibit 10. The risk to DWDP and our thesis is that the trend line has not changed and that all we are seeing is a deal at a cyclical high, with the patterns in Exhibits 11 and 12 likely to repeat. This would not be the first time that management “it’s different this time” rhetoric had been wrong, as the charts clearly show. 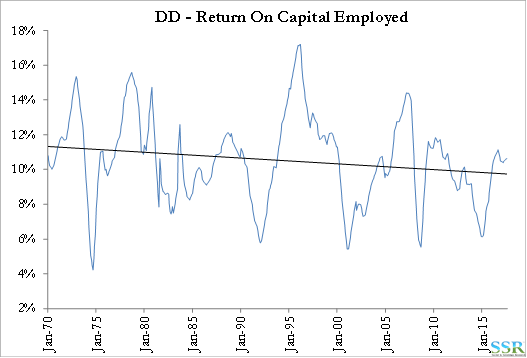 It would be a first for us however, as we are “reversion to the mean” junkies! If this is simply another cyclical high then dumping the piece that has the broadest commodity exposure would be the right thing – sell/spin ethylene, polyethylene and polyurethanes now and load the business with debt. But, also for the first time, we think ethylene is going to be different, because of the feedstock cost dislocations and because of the almost geometric move in the cost of construction – see recent work.